I don't like to watch movies alone. I was coercing my roomies for the last 6 months to watch Pyaasa, which was lying on my drive since I left home. But finally I decided to watch it alone, "forgive them, for they don't know what they do..."
Pyaasa is a masterpiece, a benchmark in cinema. No wonder its in the Time's greatest 100 films of all time. Regarded as Guru Dutt's probably finest work alongwith equally laudable efforts by the lyricsist Sahir Ludhiyanvi and the music maestro S. D. Burman. The story is of poet's journey as he discovers the ways of the society. And the lyricsist makes sure that every verse is attributable to a celebrated poet. The cinematography is very very novel for those times. The angles used are very unconventional. And there is heavy use of those shots where the camera goes from a distance to close-up. It eventually became famous as "the Guru Dutt shot". The use of light and shadows is impactful. Guru Dutt tries to convey a lot just from the lighting of the scenes. The scene where he comes up from a river bank after knowing about the loss of his mother and the climax where he stands in the theatre door, portray deep thoughts. There is also a scene in the elevator where the camera goes to Mala Sinha's reflection on the metal interiors which then blends to a flash back, very innovative. Guru Dutt weaves the story, verses and songs together and every song (except the Sar jo tera chakraye...) has a narrative. There are lot of silent moments in the film, and eyes are the only expression. Guru Dutt and Waheeda Rahman as actors are tremendous, and they make the film's technical expertise more than worth the effort. Though Guru Dutt's signature raised eyebrows are used a bit too much. 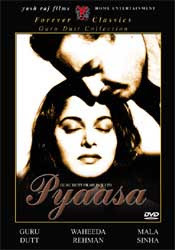 Pyaasa is really a masterpiece. Acting and lyrics are too good compared with modern Bollywood films. Humour is also an intellectual humour and not just copying somone like they do today. But, what is this " The rabbit is never in the hat " story ? Plz do tell ! hey...great reviews..i hv been longing to see dis movie...can u plz teel me where csn i watch dis movie online? ?